A few years ago the museum acquired another tractor for its collection, a 1940 9N Ford. It took quite awhile in the gettin’. A couple generations ago a family had a farm on several hundred acres along Hawkins Rd. in Richfield Twp. It had a nice old farm house, big well maintained fields, and very large barn that had exceptionally wide roof boards. Near the house the family built a really nice outdoor, stone fireplace which was featured in a long ago Cleveland newspaper article and was apparently somewhat famous for quite a while. The barn lasted until about 15 years ago when it was torn down, in part because of the depredations of a pack of ground hogs who undermined its foundation. But, at least, those large roof boards were saved and sold to panel a restaurant in Cleveland. The fireplace still stands, but is suffering a great deal from the weather of the past 60 some years. And of course the farm had several tractors, tillers and other equipment. The family eventually sold the land in three pieces. The house and barn and about 30 acres went to a couple of guys (both named John) who raised and raced sulky horses. (For many years I made hay for them on about 20 of their acres, and stored it in their barn for the horses. During those years I also acquired several of the original farm’s nearly eight hundred pound tillers. Those things were brutes. It’s hard to imagine them easier to use than horses, but they must have been.) Another 30 or so acres went to a guy living in Hinckley, who let me make hay every year for feeding my Hereford cattle, and it helped him by keeping the land mowed. The remainder of the land was sold to a couple of city folks who put up a small building, an outhouse and a picnic table or two near the pond, and used the area as a place to get out of town on weekends. When they bought the land, they acquired one of the farm’s tractors to keep the fields mowed. But they didn’t seem to be much at maintenance and they ended up parking the no longer running tractor in a small shed. There it sat for the next 40+ years. About 38 years ago they hired me to mow the fields. I continued to do so for a number of years, until they got divorced and neither one of them would agree to pay me for the most recent hours of mowing I had done for them. Over the years I have occasionally wondered about the tractor, so now and again I checked on it. It began to sink a bit into the dirt from just the action of freezing and thawing. And the shed began to fall. It was a shame to see a once nice tractor go to rust (as I have seen so many tractors and various other equipment rot in fields, left behind on once productive, now abandoned, farms.). Every so often I would contact the old lady about paying me the due on the work I had done, and I also asked her about selling me the tractor. But she was an plain ornery person (as so said everyone I ever talked to about her, –including her family) and she wouldn’t talk about settling or selling. When finally the old lady sold the land I went to talk to the new owner. He said sure I could have the tractor just for the hauling it away. There was just one problem. The lady had specified in the land contract that she would maintain ownership of that darn tractor, and she could come get it whenever she wanted. Of course by then she was in her nineties and hadn’t been out of her house in years (according to her family who lived in the other half of the family duplex). She was just by gosh going to hold on to that tractor until the bitter end. But, fortunately, the new owner wanted it gone, so we decided I could store the old rusty Ford until she came and got it. And it’s been here now for some time. So, at last she is gone, having left a bit of havoc in her wake. 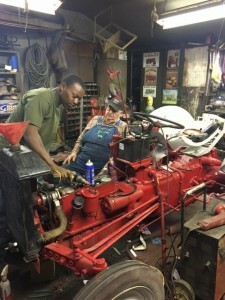 The tractor is now “free”, and we have asked our good friend Ward Cox, and his apprentice James, to restore it to running. 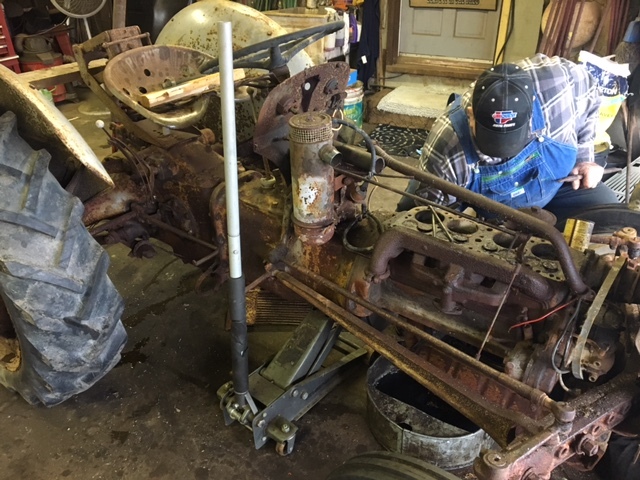 We’ve so far spent far too much money on parts and labor to fix it, we could have bought a similar tractor in good condition for less. But sometimes it’s just the doing of something that matters, not the practicality. We’ll use it to make some hay for the animals and do some work around the museum. And it will recall the stories of the folks that first owned it, and it will remind of the lady who just wouldn’t let it go. Four or five years ago, before I had the tractor, the grandson of the original owners stopped by. We got to talking and he mentioned how much he had liked that tractor when he was a kid visiting his grandparents on their farm. We took a walk and he was quite sad to see it in its depleted condition in that falling shed. I hope he stops by again sometime, and sees how great that old Ford looks now. I ‘spect he’ll even take it out for another spin like he did so many years ago. –Historical Note: The 9N tractors were mainly sold before WW2. They were/are about a twenty horse utility tractor widely used on farms of the era. 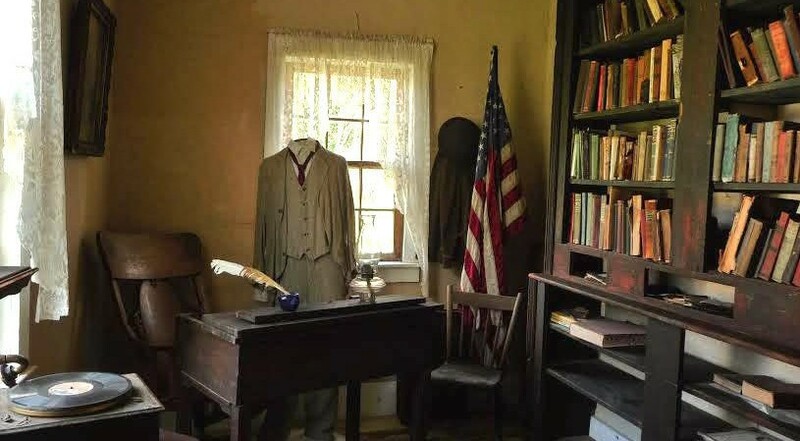 With the start of the war, Roosevelt imposed price freezes on many of the goods sold those days, mostly to prevent price gouging and inflation from war caused shortages. Ford couldn’t afford to sell the 9N’s for the prewar price, so they came out with a “new” tractor, the 2N. 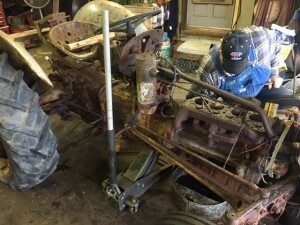 The 2 and 9N’s were virtually the same tractor, with the only difference being that Ford removed the battery and starter from the 9, and installed a magneto and starting crank to make it a 2N. The 2N was thus considered a “new” model tractor so the price could be raised (even though it was a bit harder to use).